Upload the latest XDR-I2C using Arduino IDE to your Seeeduino board. Antenna input alignment function is now splitted into a separate file (align.ino), so don’t forget to update it with your own values. The network connection requires a dedicated server. I’m working on a Linux version, but stable version isn’t available at the moment. Antenna switching is one of the features requested by users. An external RF switch is required. I haven’t build it myself, but Petr Vozár (4 antennas) and Mike Fallon (2 antennas) are using it. Check Modified tuners page for more info. The antenna plotting function requires a rotator (full 360°). 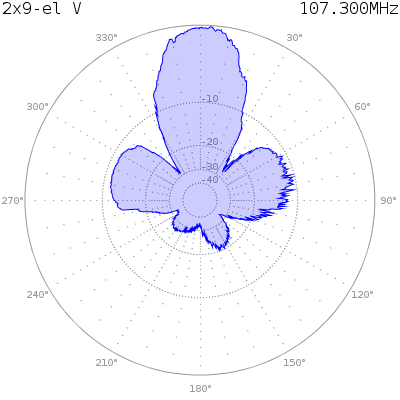 For best measurements an signal attentuator between XDR and antenna may be necessary. Many thanks to Przemysław Korpas (SQ7JHV) from Warsaw University of Technology for help with signal meter calibration using a professional signal generator. I compared two XDRs and they seem to give very close results. 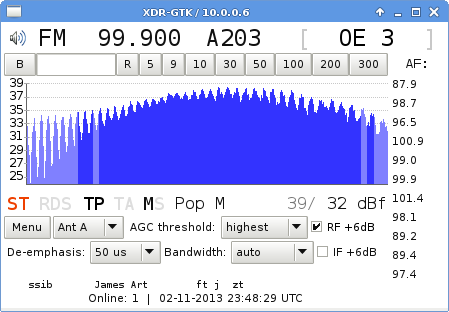 Maximum signal strength reported by XDR is around -35dBm /75Ω/ (‚old’ 102dB value). For best results set AGC threshold to highest, turn off RF and IF +6dB gain and make sure that antenna input is properly aligned. For measuring local stations with very high signals consider using an attentuator. E-mail (optional / opcjonalnie): Your e-mail address will not be published.